A simple and classic design cut from 3/16". 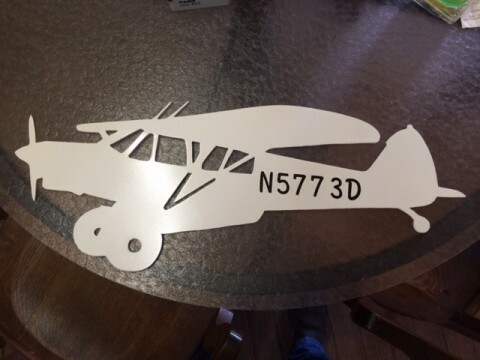 This is a really neat piece that was made for a customer in California. They are a music group that travels around in the California area playing older Rock-N-Roll. He needed the sign to fit within a frame that he had made by a local fab shop. The idea is that it's moble and can easily be moved from one preformance to next. This project turned out great, despite the low quality image I have. I fabricated the gate, side panels and art work. 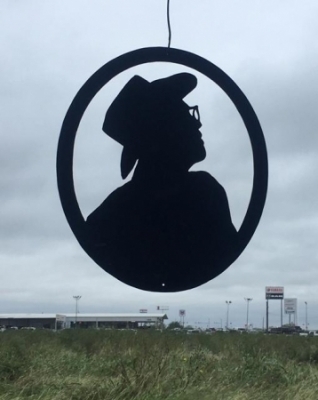 To add a touch of personalization, I took a somewhat side profile of my customer and used him in place of the Davy Crockett cut out featured in the top center of the sign. 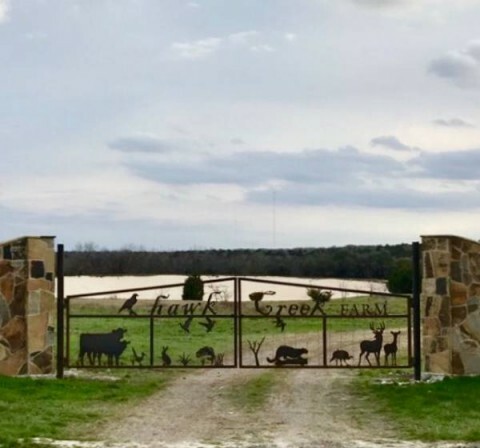 The shape of the gate resembles the Alamo and the other artwork represents the wildlife and landscape found on the ranch. Pics below are screen shots from the design phase of this project. **All pieces and rock colums were installed by a 3rd party company. 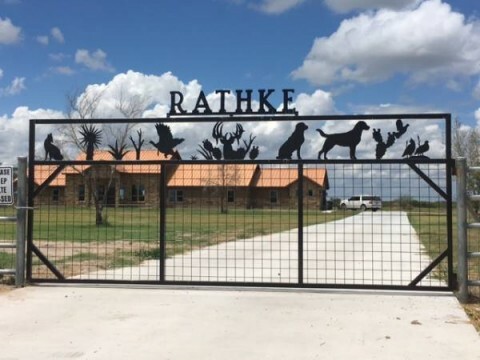 These ranch gate insert was cut from 3/16" steel, then welded in place by the owner. 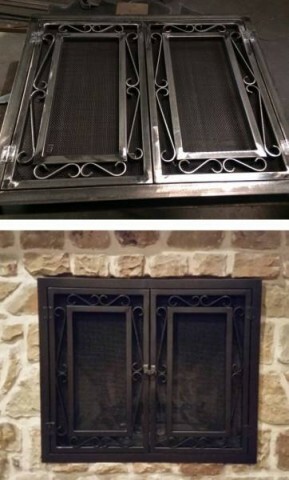 Custom fireplace screen. 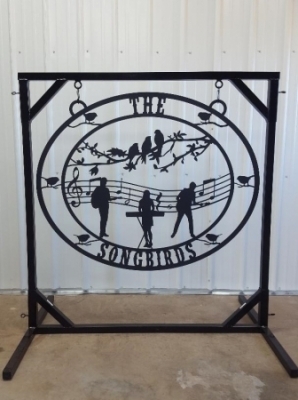 The art was cut from 3/16" steel, frame was make from square tubing and a heavy wire screen stretched arcoss. A customer came to me and aked if I could create something out of an old windmill from the family ranch. 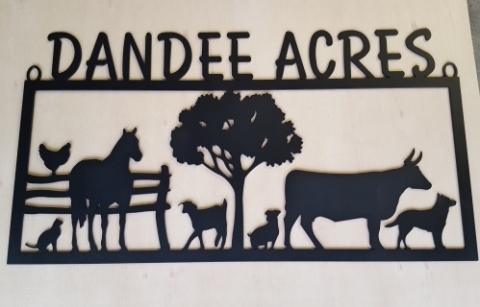 I framed out the original piece, then attached it to a circular farm sign to simulate a windmill shape. I love these kinds of projects. A customer asked me if I could replicate their Grandad from the side profile they had. What a great way to remember a special someone. 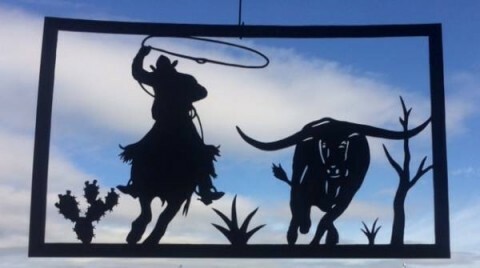 A customer aked me to create some western art that can be welded to a table that he is making that will feature a beautiful mesquite top. I'll up date with pics once the table is complete. Both pieces are cut from 3/16" steel. 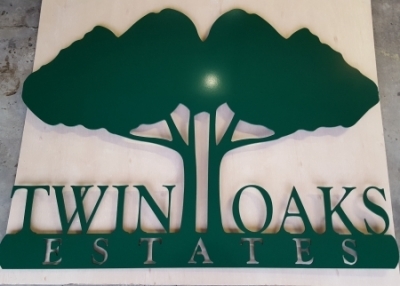 This Twin Oaks Estates sign was cut from 3/16" plate. 4 small tabs were welded on the back side so that it can be bolted to some wooden uprights on the left and right side. It was finished off with a glossy green powder coat. 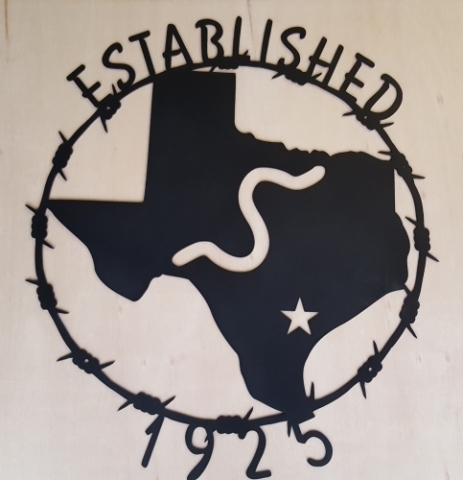 Barbwire circling around the Lone Star state of Texas. 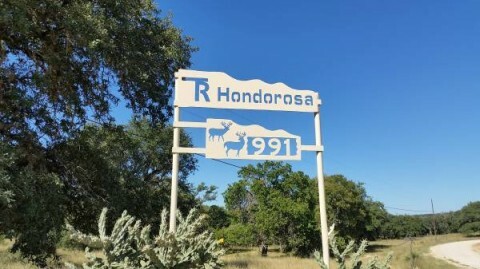 The land owners brand and an established date. Mounting holes are nested in the barbwire for easy mounting. 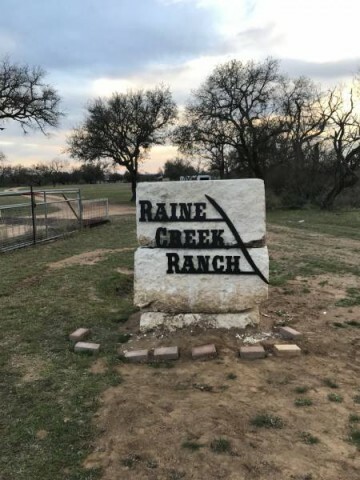 Raine Creek Ranch Sign in west Texas was cut from 3/16" steel, sand blasted and powder coated. 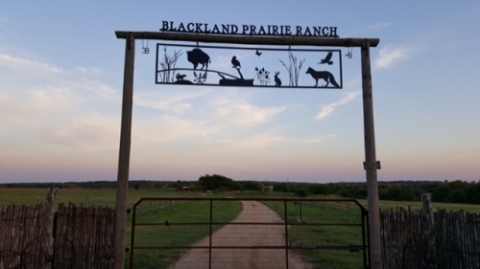 Mounting holes were provided so the sign could be easily mounting onto the limestone rock at the ranch entrance. 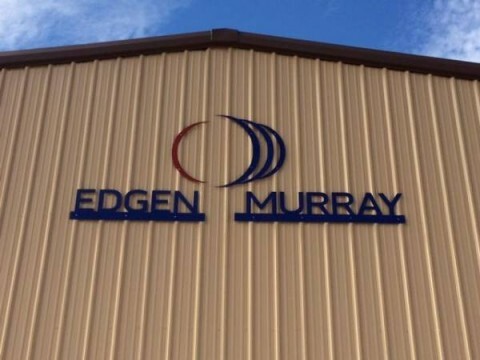 Edgen Murray (Oil Field & Natural Gas Industry) asked me to recreate their logo for one of their South Texas locations. 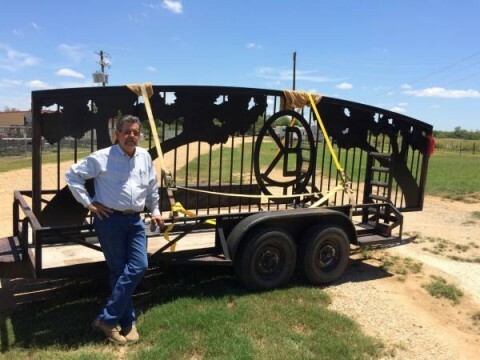 The metal was cut from 1/8" steel and coated with a tough automotive paint to withstand the blazing hot Texas sun. 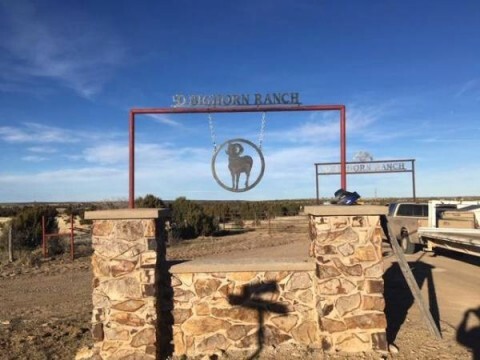 4D Big Horn Ranch is located in Colorado. 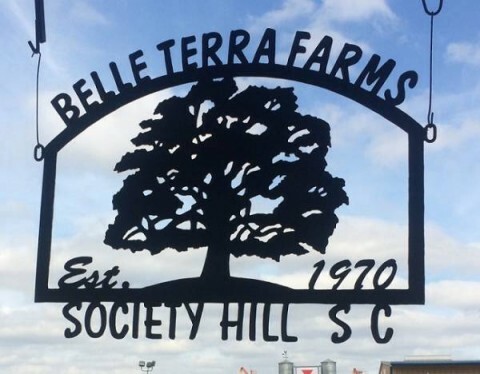 Both signs were cut from 3/16" thick metal and installed by the customer. 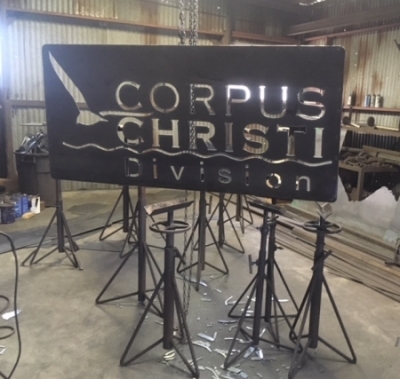 The overhead entrance sign in the background is kind of hard to make out so I'm including a pic of the layout that I created for the customer while in the design stage. JNL Ranch is located on the Frio River just outside of Leakey, TX. 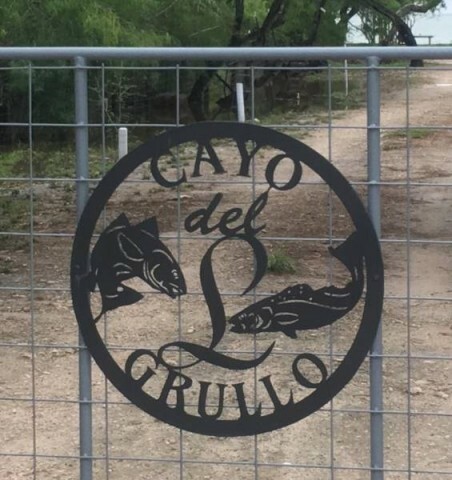 If you're ever looking for a beautiful place to relax with the family on the Frio River be sure to look them up. 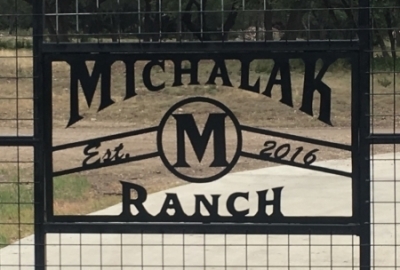 This ranch gate entrance sign was cut from 1/8" steel and mounted to their gate. 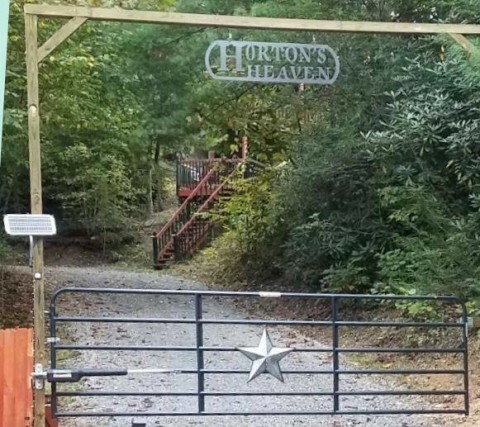 "Hi Jerry, well we finally built our entry gate up to our heaven. The sign you had previously constructed so very well for us initially hung out by our roadway gate. But now it is moved closer to our home at the foot of our advent up to our cabin. Again, thanks so very much. The sign is still like new and will have many looks from our visitors. Great work!! Take care my friend." 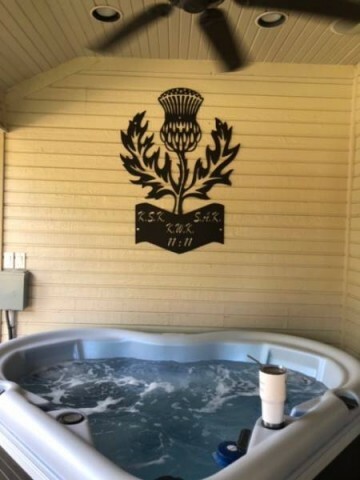 36" tall Scottish Thistle was cut from 1/8" plate, sand blasted and powder coated in a texture black. I've never seen one of these before this project but it sure is a beautiful creation. A customer came to me with an idea for her brother. 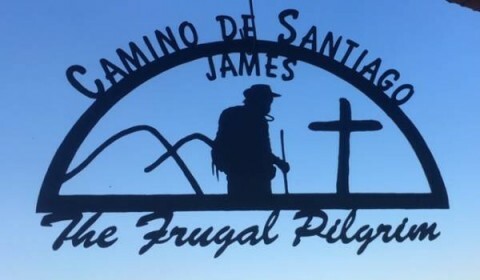 He was 70 years old and had always wanted to do a 500 mile hike across Spain. He made it, and she brought me a picture of him on the trail. 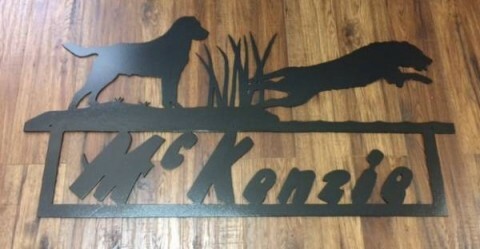 I was able to pull a silhouette of him from the pic and create this metal sign to last a life time. 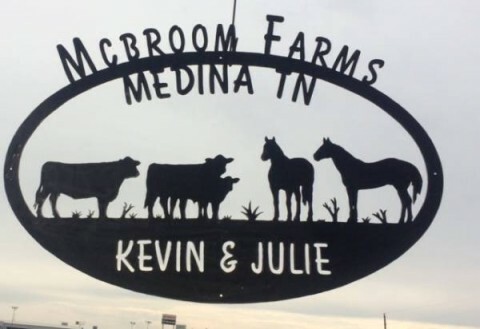 Here is a sign that I did for a customer in which I didn't know the full story behind the name. Below is from my customer after the metal sign was installed. 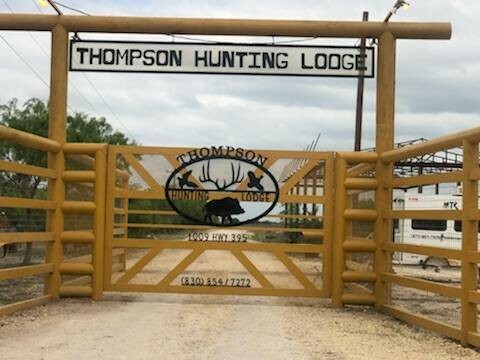 Previously I posted a pic of the Thompson Hunting Lodge sign that was freshly cut. They sent me a pic of the installed sign and I'm thrilled about how nicely their entrance looks. 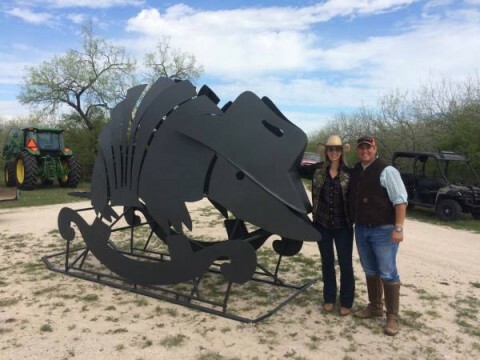 Rockin Armadillo ranch sign was cut from 3/16" plate steel, finished in black paint and installed on a South Texas Ranch. I think I made this sign over 20 years ago. My customer brought it back to me recently and asked if I could clean it up with a fresh paint job. What I like to call a "liquid overhaul". 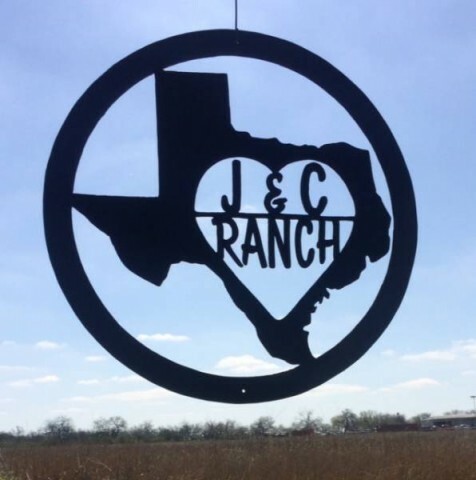 Hawk Creek Farm is located in the Houston Area. 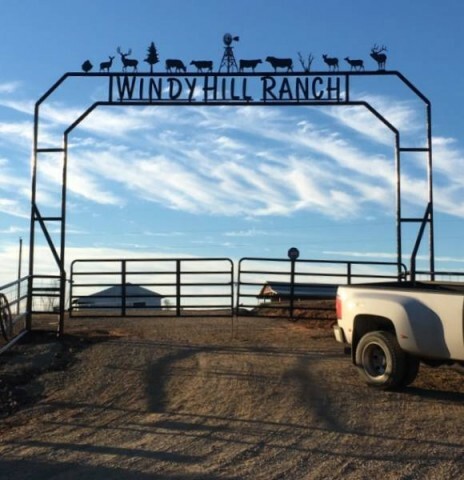 The gate frame was constructed with 2 inch square tubing, backed with cattle panel and the metal art is cut from 3/16" plate steel. Riverwood Entrance sign was cut from 3/16" and powder coated with a dark bronze. A gal called me and asked me to make a gift for her father who ownes the Giddings Tilapia Fish Farm. Together we came up with this design. 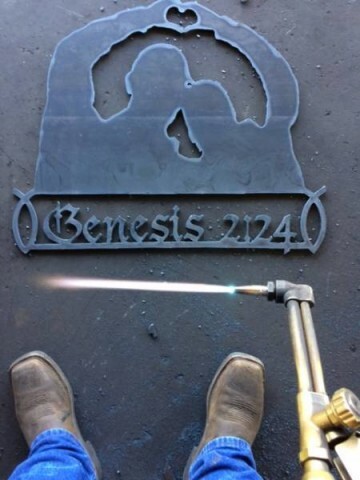 Cut from 3/16" plate, finished with an industrial black paint. Here is a nice Colorado mountain scene address sign that I made for a customer in Colorado. Each corner has a hole for easy mounting with a basic screw. Cut from 3/16" plate. 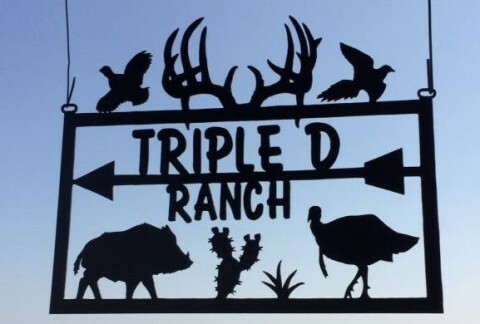 Thompson Hunting Lodge sign, cut from 3/16 plate steel. 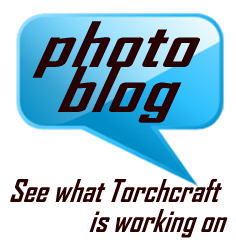 Still hot from the torch. See the installed photo here. 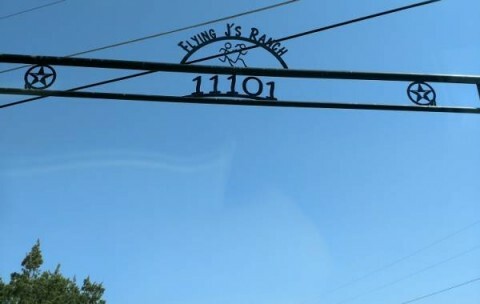 I love the way this sign reflects the mountain range located on this ranch in California. It measures 8 foot wide and cut from a heavy duty 3/16" plate, it should last a lifetime and then some. 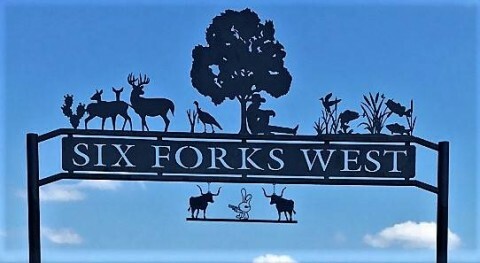 Farm sign showing how long they have been established wih an Oak tree showcasing the sign. Cut from 3/16" plate steel that will last a lifetime. 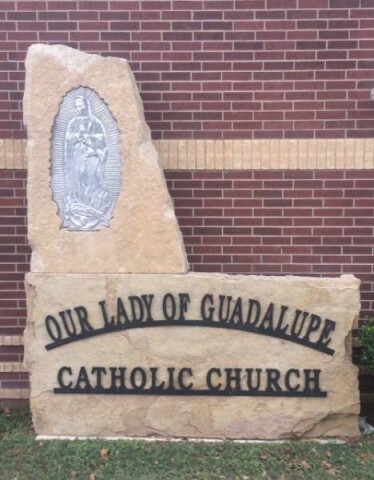 This lettering is for a Catholic Church just a few miles away in Poteet, TX. I always love the black metal contrasting against the white limestone. A side note, when mounting letters like this you, need to be cautious of how the shadows between the metal letters and white rock might affect your ability to read the letters at a distance. The best way to fix this is mount the letters close to the rock or whatever your mounting them to so that a shadow can't get behind the letters very easily. Looks like the installer did a good job on this install. I cut this sign back in July and have been waiting to post the pic since it was a wedding gift. Can't risk ruining the surprise. A customer contacted me about cutting out a silhouette of this couple forming a heart with their hands to be given as a wedding gift. It came out great and I really enjoy doing these unique items for people. 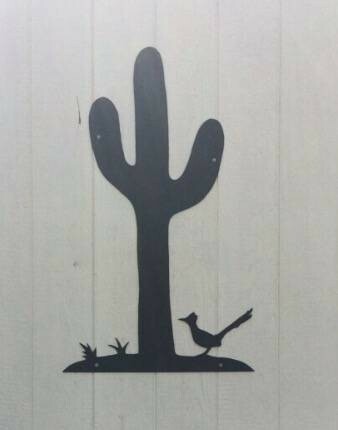 This sign was shipped out to San Diego, CA. Click the "Continue Reading" link to see the image the customer first sent me. 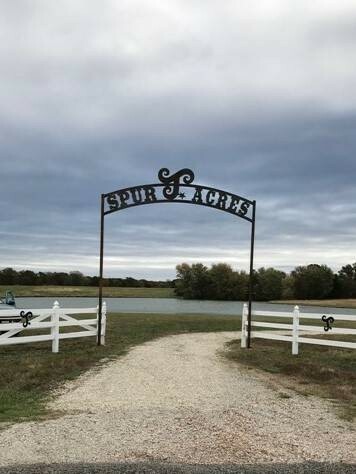 Seems like just a few days after shipping this overhead ranch sign off to Missouri, I recieved these pics of the install. 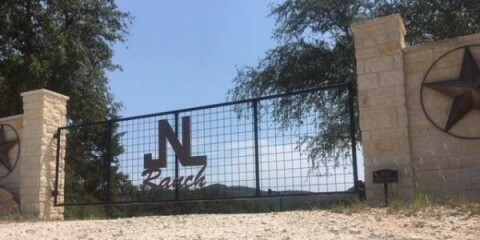 They certainly wasted no time getting their ranch sign installed. As usual, it is cut from 3/16" plate and braced on the back side for added strength. 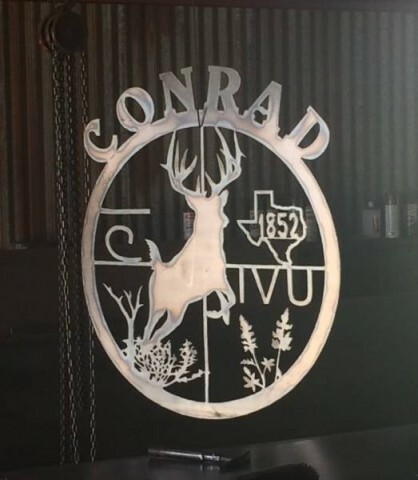 Here is a simple wedding gift for a couple that was cut from 3/16" plate steel. It should last them a lifetime. 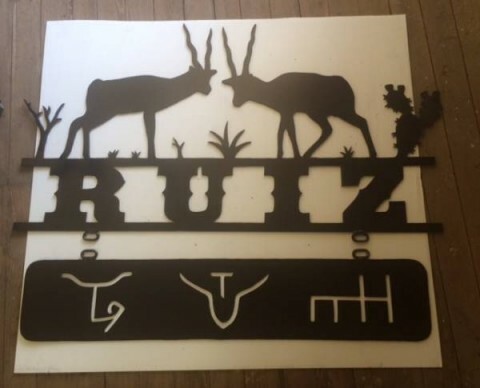 A friend who owns a gate and entrance business orderd some art to install on one of their custom gate builds. 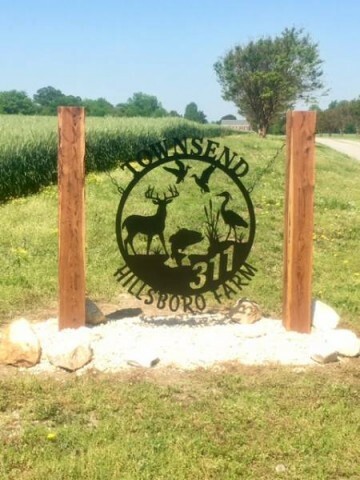 I frequently get orders like this where someone would like to add some art or lettering to an existing gate or they are having a gate built but need some art or lettering to be added. This piece will be welded in place, then painted. This piece was ordered to go above the family fireplace. It is a Family Crest for Gallbraith name and says "Stronger When Oppressed". It was cut from 3/16" new plate steel and will be painted dark bronze. Click "Continue Reading" link to see picture of this piece mounted above the fireplace. 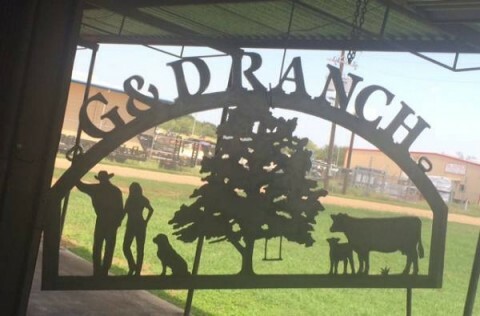 This 20 foot Oak Tree spans across this ranch gate and stands 9 foot tall. It is a fairly complex design with so much detail in the many branchs and leaves. The tree is cut from 3/16" plate and welded to the gate which I also made. 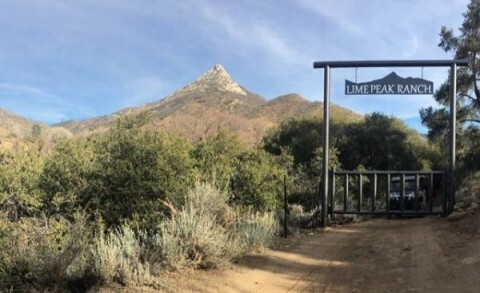 The owner had a crew install the gate on location. 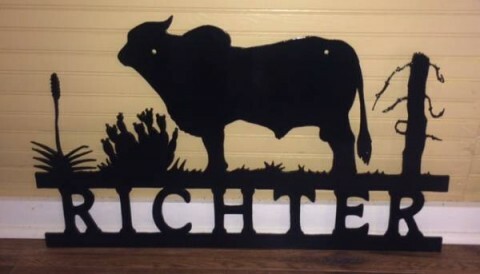 This unique overhead ranch sign belongs to the new ower of a ranch near George West, TX. The customer furnised his logo of a rocking armadillo which was cut from 3/16" plate steel. Braces on the back side with strap steel for added strength. Stoddard Construction of San Antonio has been rebuilding some of the Freer ISD buildings. 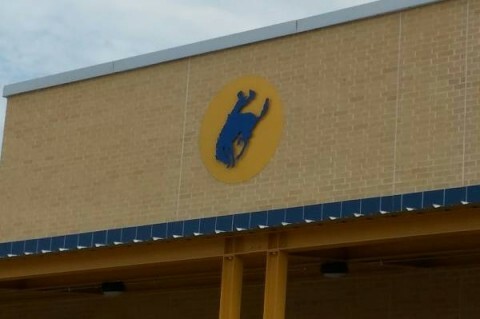 They wanted to give the school district this logo as a token of their appreciation for the contract. The circle is 10 gauge steel and 60" in diameter. The Buckaroo is cut from 3/16 plate. Colors are school colors. The Oaks At Heavenly is a beautiful wedding venue in Helotes, TX. 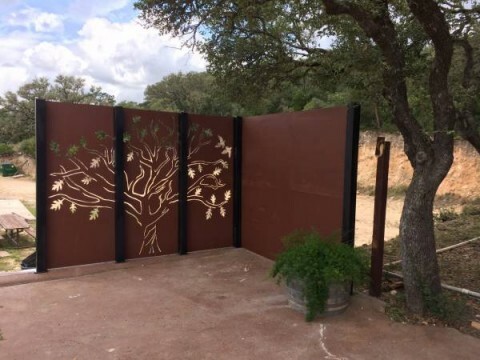 They needed to block a view on their property and requested a metal panel with a reverse Oak tree cut out. The 3 panels that make up the tree measure 7 foot tall by 10 foot wide. They also added a blank panel that forms a 90 degee turn that measures 7 foot tall by 8 foot wide. The panels are finished in a rust colored paint and mounted to 4x4 inch square tubing post. The art features 2 doves "leaving the nest" and symbolizes new "Love Connections". The tree panels will also feature back lighting for a wonderful glow in the evenings. This project turned out beautiful and I'm glad that I got to be a part of it. A close friend wanted to give her husband a gift for their 50th wedding annivesary. This plaque hangs above their fireplace mantle and displays the four family brands that they have used in the past and present. The plaque is cut from 10 guage (1/8") to keep weight down and painted with a Rustoleum "Hammered" finish. Vet. clinic in Jacksonville, Florida originally had me make his logo for the outside of the clinic building but recently requested a similar piece be made for the inside. Each piece is welded to the round circle and ground to a shinny finish. Clear coated for protection. The art that is shown has been sand blasted and painted with a two part paint. The pieces have 3/8" threaded bolts welded to the back side and anchored into the masonry wall. The Texas painted in Texas flag colors is 36" wide. 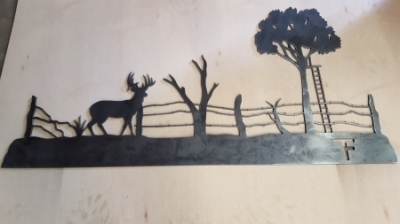 Cut out of 3/16" plate steel. 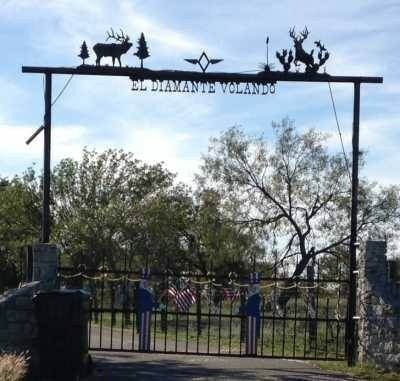 Beautiful South Texas entrance and I am proud to be part of it. When I was young, a good friend and his dad would always have a shoot off in the back yard to see who had to wash dishes when mom and sister were not home. They always shot until they had a tie.....so the dirty dishes where still there when mom and sis returned. That is the Texas Way! 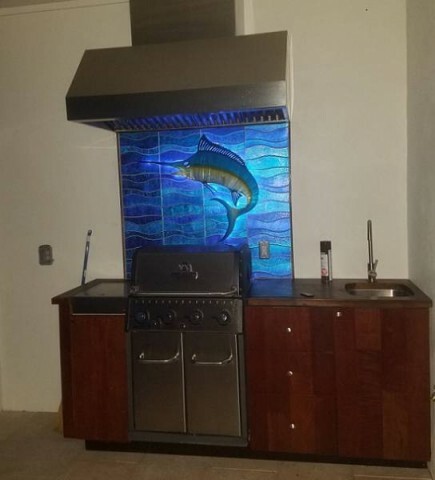 I had an order from Florida for a marlin to be placed above the outdoor grill. Upon receiving the unpainted fish, the customer found a local artist who ground the metal down to a shinny finish and then airbrushed the detail of the fish. Once the colors were added, several coats of clear coat where applied. The finished product is amazing. Customer ordered a two door fireplace screen to mount in the opening he has for his fireplace. Doors are made from 1' square tubing with 1"x3/16" flat bar rolled in scrolls. A heavy screen wire is welded on the back side of the doors. The frame was made first and the customer tried the frame in the opening to mark the holes for mounting and verify the size was correct. The top picture is unpainted in my shop and the second is furnished by the customer after he installed it. 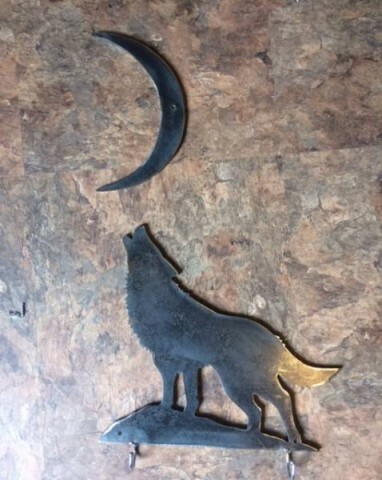 Little girl loves wolves and this wall rack with hooks was ordered for her. The piece is unpainted. Has chrome hooks for hanging whatever. Cut from 3/16" plate. Gift for young boy who is playing baseball. 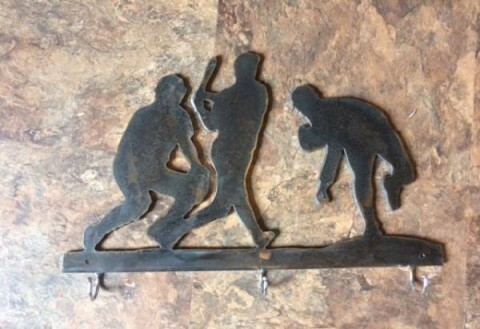 This will give him a place to hang his baseball items. Cut from 3/16" and hooks are made from chrome plated steel. This item has not been painted. 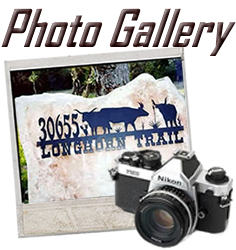 Windy Hill Ranch is owned by some very nice Lousana people who own and operate a shimping business. 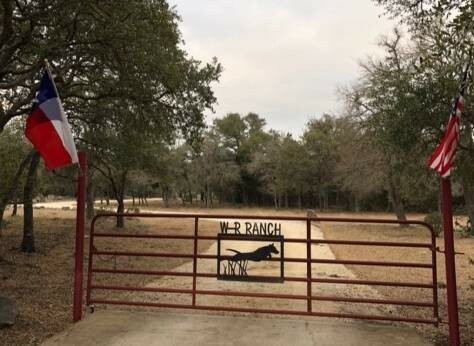 They bought this East Texas ranch and did a great job of building a nice entrance with the help of Torchcraft. Who says Cajuns don't have good taste? 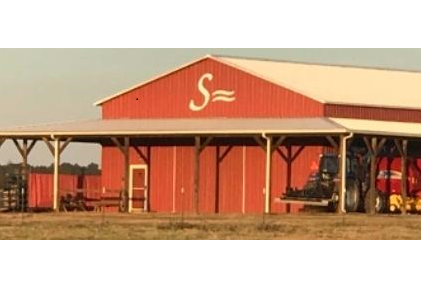 There is a new barn in the brush country with some art on the side that really looks good. The customer asked for part of the pieces to be tempered and then they were painted and clear coated with a powder coating finish. Very nice effect. Very nice customer to work with. 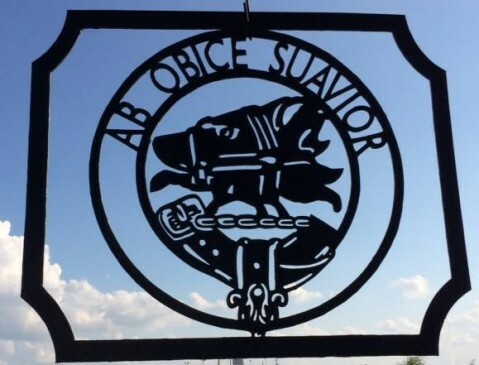 This recent sign was sent to Colorado and is hanging on some really nice large wooden poles. Cut from 3/16" plate and is about 10 feet wide. This is not a recent creation. I made this cross quite some time ago and noticed the picture the other day so I decided to publish it again. This cross was copied from a photograph of a cross that the Oblates had erected in France in the 1800's. 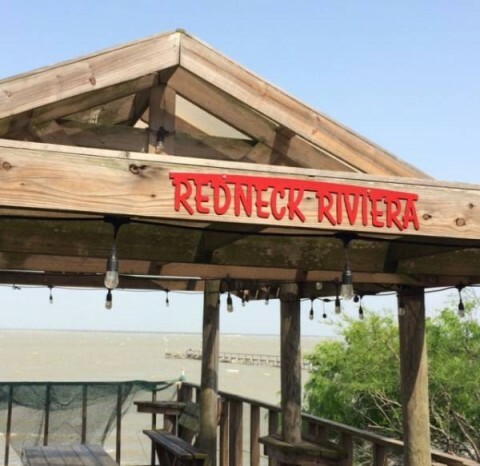 It now overlooks the lake at a new Catholic church in Ausin, Texas. 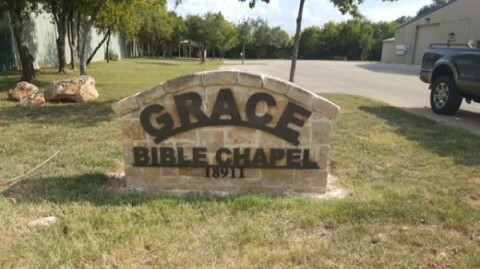 Sign made for church yard. This is just something that I made recenty and I am not finished with it. I plan on placing some glass lamp lens along the front to hold candles. For now, I am publishing the coyote The arch is .75" square tubing that has been rolled in an arch. Bottom is same tubing. This is a new twist. Customer built a 5 foot box out of 3/16" plate steel. I cut the name in the face of the box and he has installed lights inside the box so the name is visible at night. 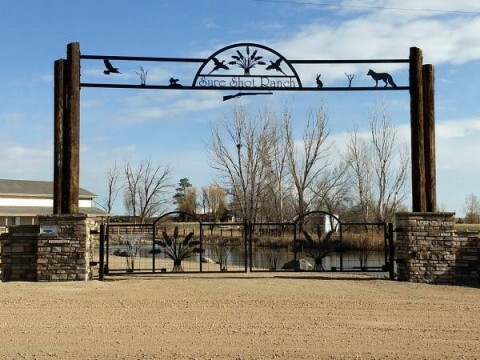 Very nice approach to a ranch entrance. 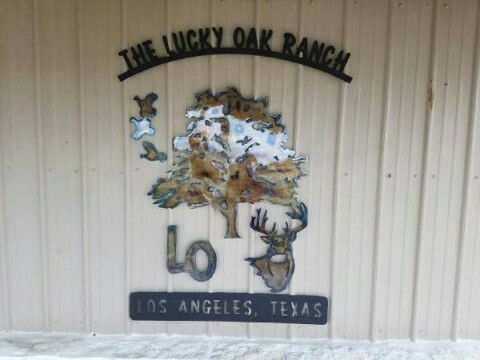 There is a new ranch owner in Los Angeles, Texas who is having a nice time with her new property. 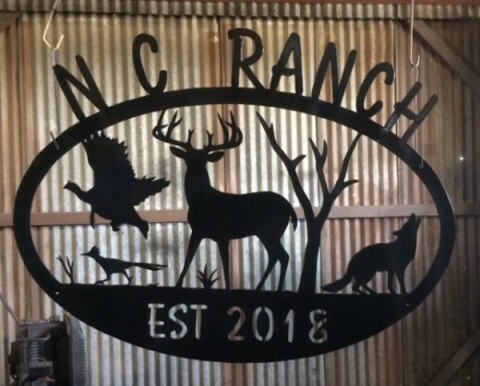 The barn will have the ranch name and other art displayed on the wall. All cut from 1/8" plate and heat tempered. The customer is taking the pieces to have them powder coated with a clear coat. 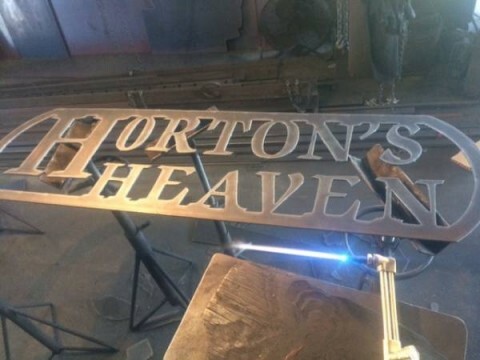 The name and location will be powder coated in black. 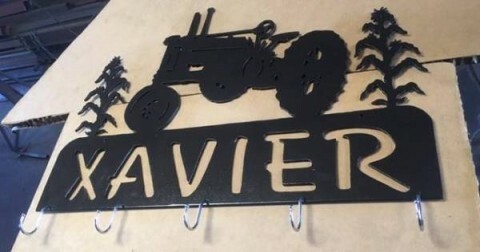 Customer designed a trailer sign cut from 1/8" plate. Circle is a 36" diameter. Left unpained for a rust finish. This is number three for a customer who loves to fish. First was a 4 foot tall sail fish, then a blue marlin and now the white marlin. All are the same size and finised in the heat tempered finish with automotive clear coat. I needed an birthday gift for my one year old newest grand daughter. 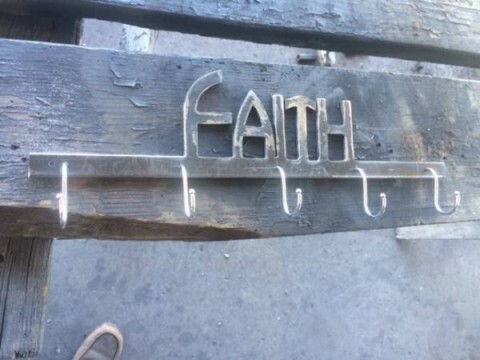 Since her name is Faith, I thought the letter font was appropriate. 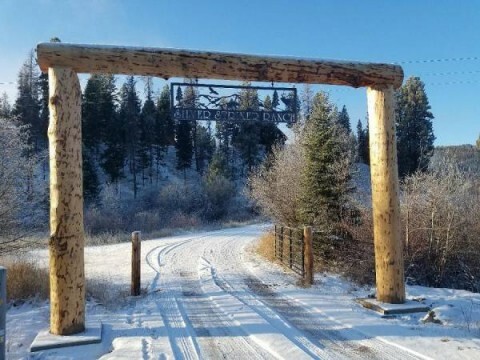 Colorado sign for Whispering Pines Ranch. 10 feet wide, cut from 3/16" plate steel. 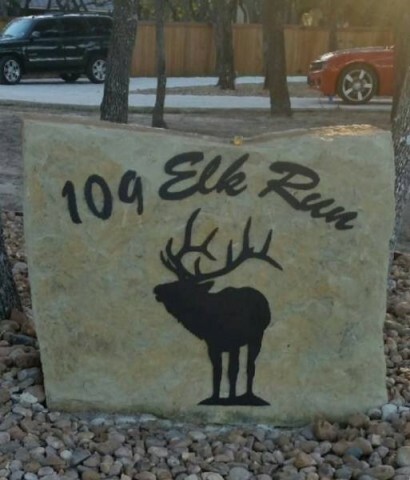 Addrress is 109 Elk street so the customer chose an elk to be displayed with the numbers. Cut from 1/8' plate for mounting on the new metal building. 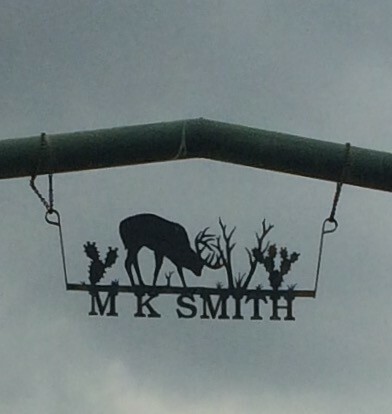 Customer has these brands sand blasted and powder coated before mounting. 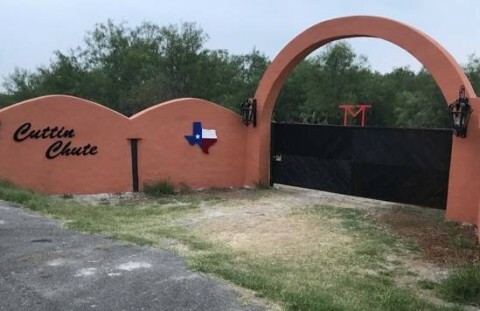 Preiously this customer ordered a gate for his new home in South Texas. That gate is posted on this blog. 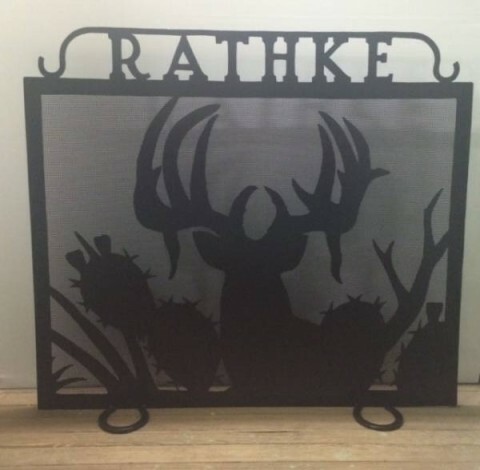 Now a fireplace screen was ordered to show the same buck used on the gate. Hopefully, he will send a picture of the screen with a nice warm fire blazing in the background. New home needs a new gate. 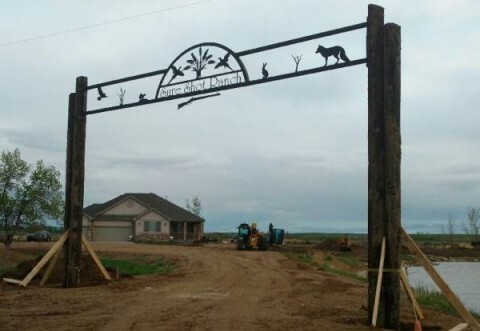 Gate depicts the things that are important to the owners. 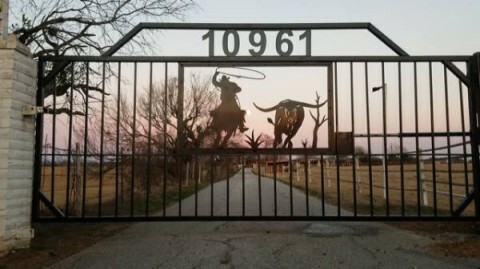 Square tube gate frame with cattle panel covering the face of the gate. Gate was powder coated. Had a repeat customer from Louisana order a gate for his dad. Gate was a gift to his dad. 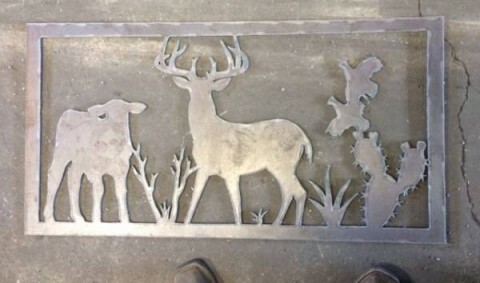 You can guess that the gate is located in the Eastern area where dogs are used to hunt deer. This order was for Father's Day. Super Cub with tundra tires is the joy of a dad in Alaska. Cut from 1/8" plate and approximately 24" long. The N numbers are vinyl and applied onto the side of the white pained bird. Great customer to work with. 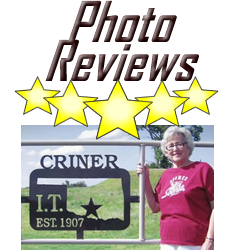 Near Lampasas Texas I recently noticed a sign that I created many years ago. 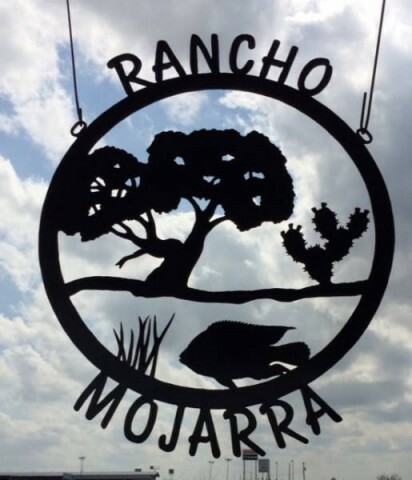 Spanish wording for Flying Diamond Ranch.